Intellectual Ventures (IV) is proud to collaborate with institutions that are similarly committed to building a global innovation ecosystem. Recently, IV’s Invention Science Fund (ISF) partnered with NAMIC to further develop 3D printing machine and service capabilities with a wide-range of potential market applications. 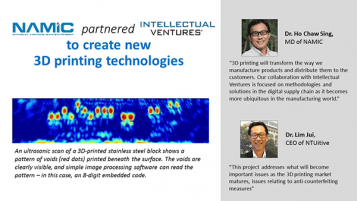 Currently, they are co-developing an Embedded Identifier Module, a technology that allows 3D printers to watermark unique identifiers within a variety of materials.